Some fifty plus men from the 8th Battalion of the Royal Warwickshire Regiment served on Operation Longcloth in 1943. 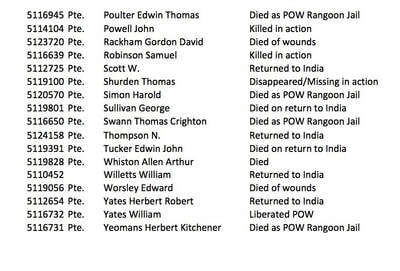 These men had joined Chindit training at Saugor on the 26th September 1942, having previously been posted to the British Base Reinforcement Camp at Deolali. Most of these soldiers had fought with the BEF in France and Belgium during 1940 and had been rescued from the beaches of Dunkirk that summer. Things went harder with the 8th Battalion on May 20th. All three forward companies were mortared, shelled, sniped and machine-gunned, with special attention to C Company on the right, where 2/Lieutenant D. F. Hanmer and RSM Knight were wounded early in the day. Battalion HQ at Warnaffles Farm was like wise shelled. So was B Echelon, back at Le Preau. C Company brought down Artillery fire on the buildings opposite its front and managed to silence the enemy there, as well as to shoot a number of Germans driven out of the buildings by shelling. As these attempts had come to nothing, the Germans resorted once more to pounding the battalion area with high-explosive. Many casualties were incurred by the battalion; and in the confusion some Germans seem to have crossed the river at about the junction between B and A Companies. All lines were smashed, and no contact could be made with Battalion HQ. 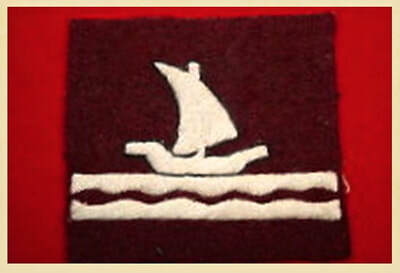 B Company had been effectively destroyed and had lost both Captain Glover and Captain H. Sparrow. The remainder of the company was led out by Sergeant Bate, but even here encountered German motor-cyclists as they moved through the main street at Calonne. Finally, and after many hours of frustration in holding on, the Warwick's were able to hand over their position to the Royal Scots. 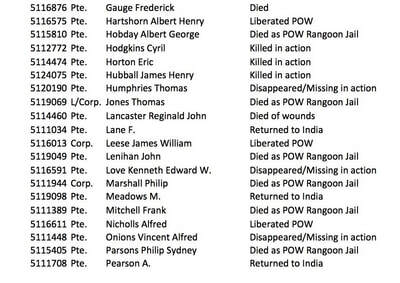 Whilst searching through files at the National Archives in December 2017, I came by accident upon several witness statements in relation to men lost at or around Calonne in May 1940, and given by soldiers who had gone on to serve with the 13th King's in Burma. 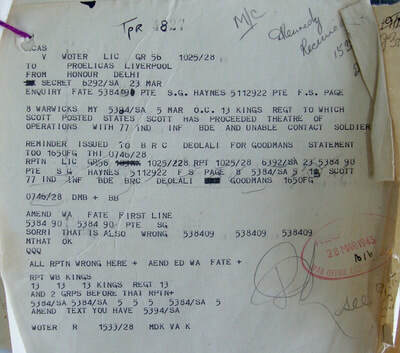 Incredibly, five of those who gave statements were new to my research and had not featured in any of the King's Regiment documents or War diaries. 5111034 Pte. 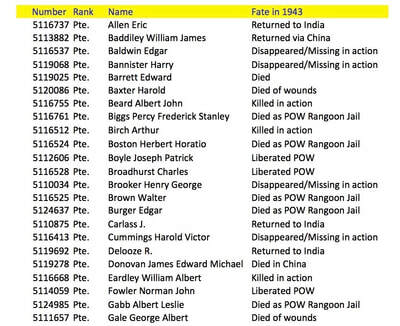 F. Lane: who had been contacted by the Army Investigation Bureau regarding 8 Warwick's casualties in May 1940. Pte. Lane had been transferred to the Yorks and Lancs Regiment in May 1942 and was awaiting his next posting (presumably to the 13th King's) whilst stationed at Deolali. 5111708 Pte. 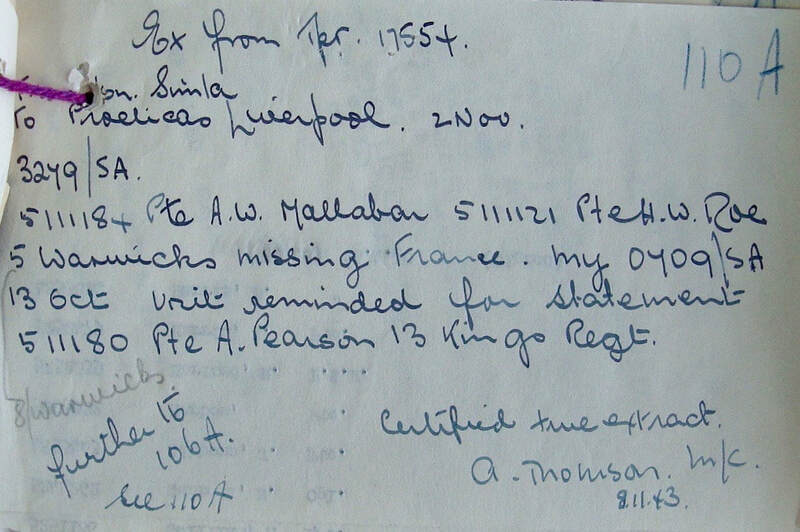 A. Pearson: who had also been contacted by the Casualty Bureau for the same reason, on the 20th January 1943 whilst at the Deolali Camp. Pte. 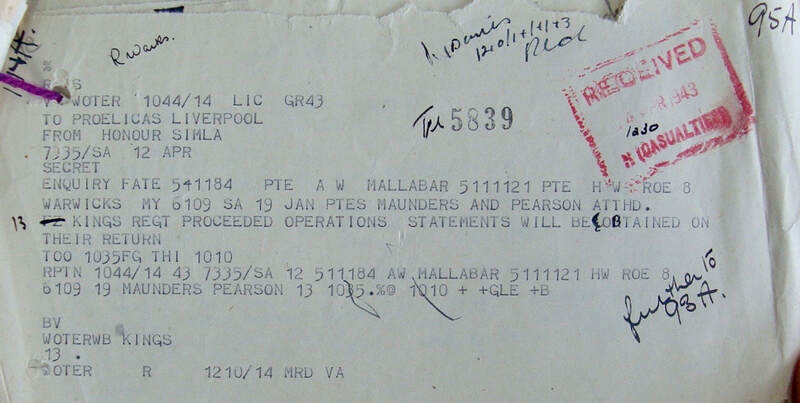 Pearson was unavailable at this time due to his pending service on Operation Longcloth and thus confirming his Chindit status. 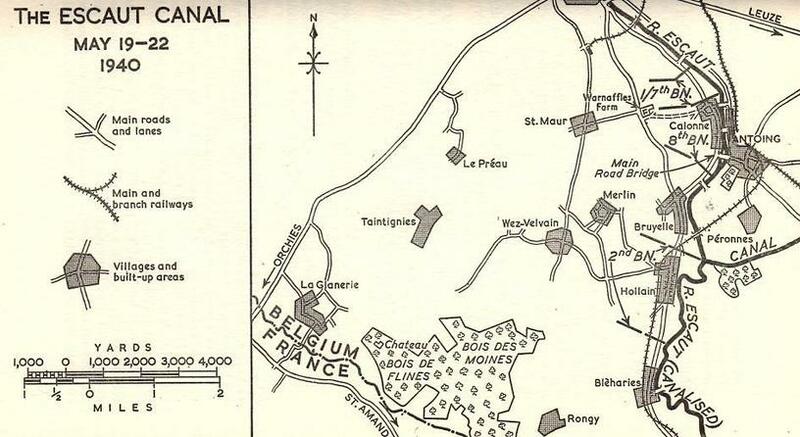 I was with Battalion Head Quarters at the time and the battalion were holding the Comminges Canal (Belgium). I saw Pte. Page with Sgt. Box's Section shortly before the battalion withdrew. He was not present when we reformed and I did not see him again. Pte. Haynes was in No. 7 Platoon and I was with No. 8 Platoon of A' Company. On approximately the 20th May, the Battalion was holding the Commignes Canal near Tournai in Belgium and was waiting to be relieved. At 0400 hours the Germans crossed the canal and attacked our position from the rear. We were ordered to take up new positions and I did not see Pte. Haynes. About an hour later we were ordered to withdraw and reform several miles away. I did not see Haynes again. I last saw these two soldiers whilst we were in convoy, but the convoy was bombed, causing myself and some of my Company to lose touch with the battalion. 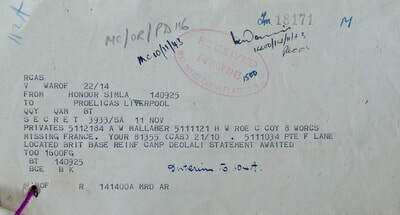 In the meantime the Company was in action on orders for the final withdrawal. At this point the roll was called, but these two soldiers did not answer their names. 5952110 Pte. 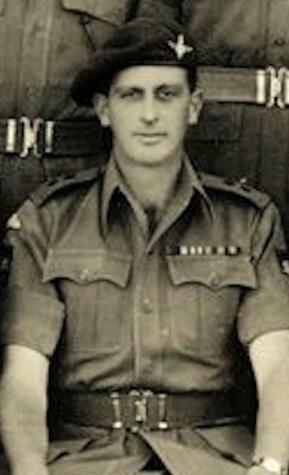 A. Maunders: who had served with 8 Column on Operation Longcloth in Burma. 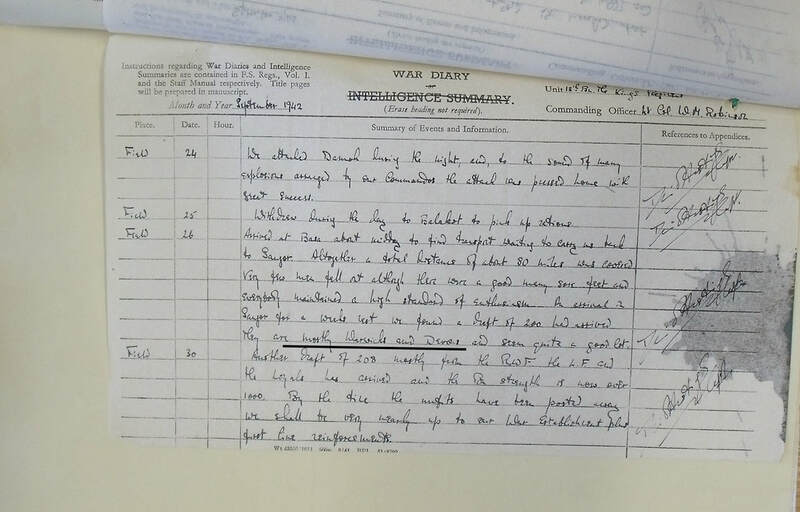 According to the new information he had been transferred to the Royal Scots Regiment after his time with the 8 Warwick's in France and Belgium and was contacted by the Casualty Bureau in this regard on 23rd August 1942. To conclude this short narrative, shown below are some of the cipher messages and statements in relation to the above mentioned men. Please click on any image to bring it forward on the page. 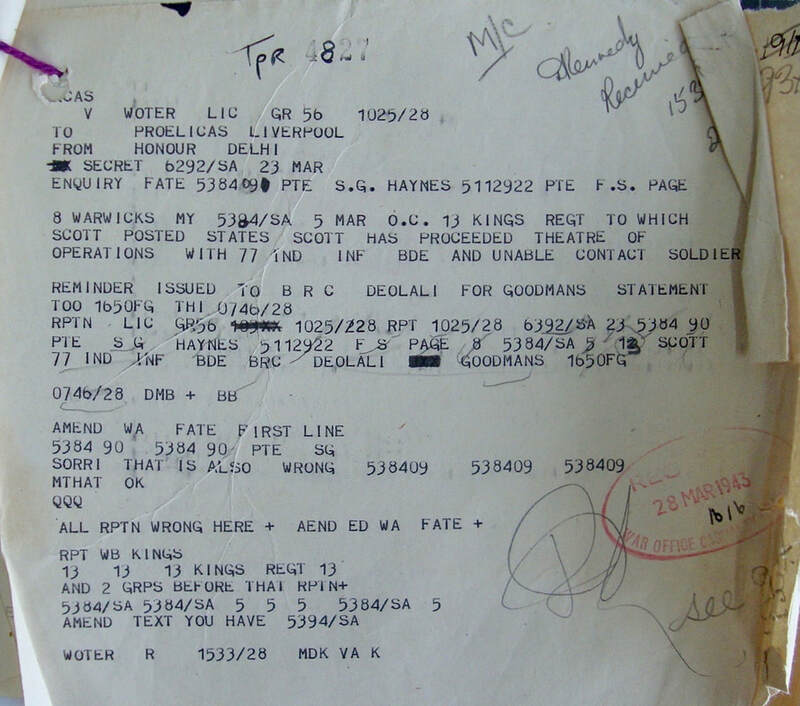 ​From my research records, seen below is a nominal roll showing the men from the Royal Warwickshire Regiment, who transferred to the 13th King's in September 1942 at the Saugor training camp. 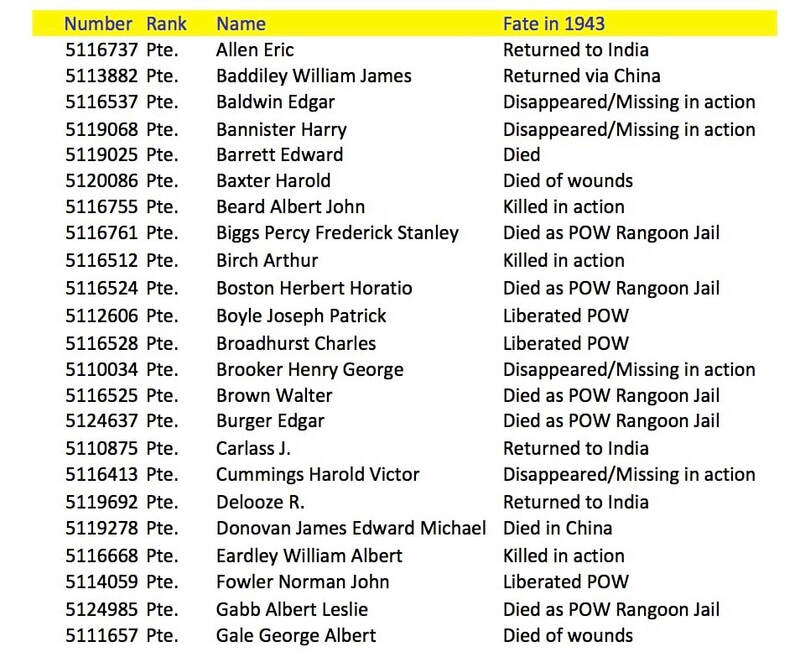 The Roll includes each soldiers Army service number, rank and his eventual fate in 1943. As you will sadly witness, the list makes for rather difficult reading. Please click on each image to bring it forward on the page. In late January this year (2018), I received the very sad news that William Willetts, a former soldier who served with the 13th King's in Burma had passed away. 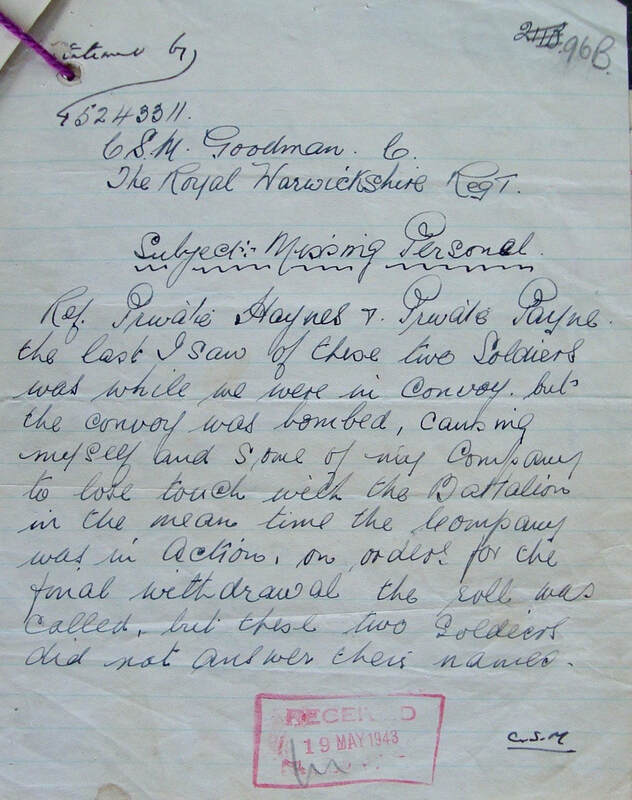 This information had been sent to Paul Shenton, the Chairman of the Chindit Society, by William's grand niece, Elizabeth Lanham. 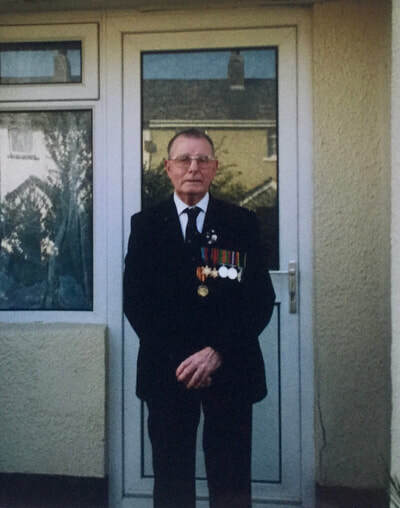 The family were aware that William, whose Army service number was 5110452, had served with the Royal Warwickshire Regiment earlier in the war and had been a survivor from the beaches of Dunkirk in the summer of 1940. 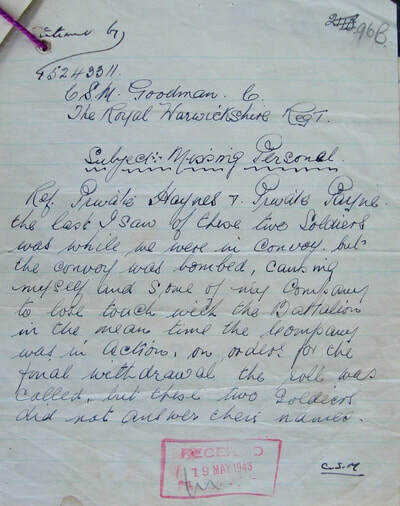 Without being absolutely certain, it seems highly likely that he was a member of the 8th Battalion of the Warwick's, and for this reason I have decided to add his story to this particular page of my website. As mentioned in the above story, a large draft of soldiers from the 7th and 8th Battalions of the Warwickshire Regiment were transferred over to the 13th King's on the 26th September 1942 and joined Chindit training at the Saugor Camp in the Central Provinces of India. These men were then allocated to the various Columns as required. 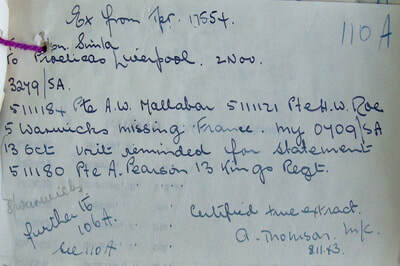 It is impossible to know which column William was posted to at Saugor in 1942 and it is unlikely that even his Army service records would give us this information. 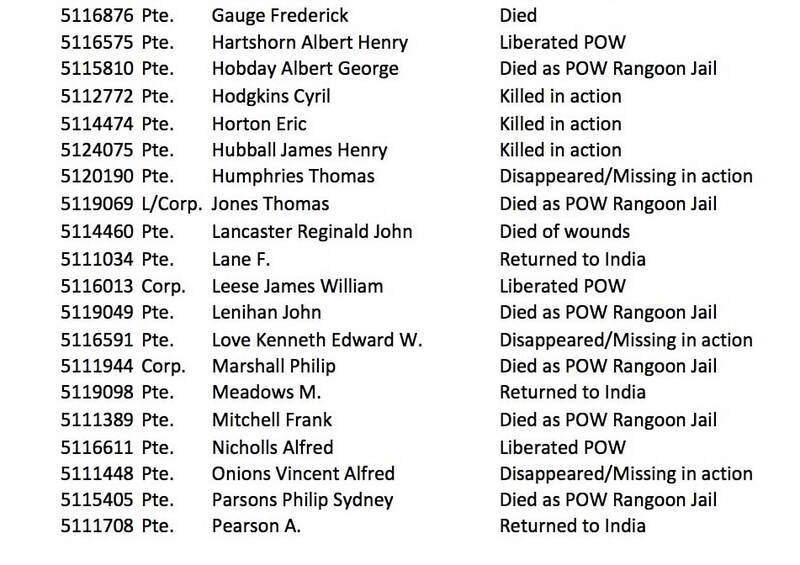 After the war, William, alongside many returning Chindits joined the Old Comrades Association based in Wolverhampton. His COCA membership certificate was signed by Walter Purcell Scott, the former commander of 8 Column on Operation Longcloth and I wonder if this might be a clue as to which column William belonged? We will probably never know for sure. After recuperating from the rigours of his time behind enemy lines in 1943, William re-joined the 13th King's at their new base in Karachi. The battalion were housed at the Napier Barracks and from here performed garrison and internal security duties in and around the city. 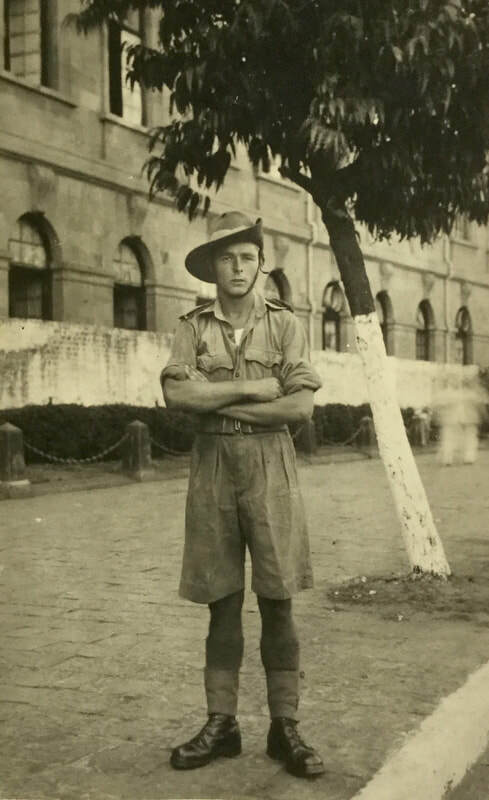 In late 1943, some men from the 13th Battalion transferred to the 1st Battalion of the King's Regiment in preparation for the second Wingate expedition into Burma. 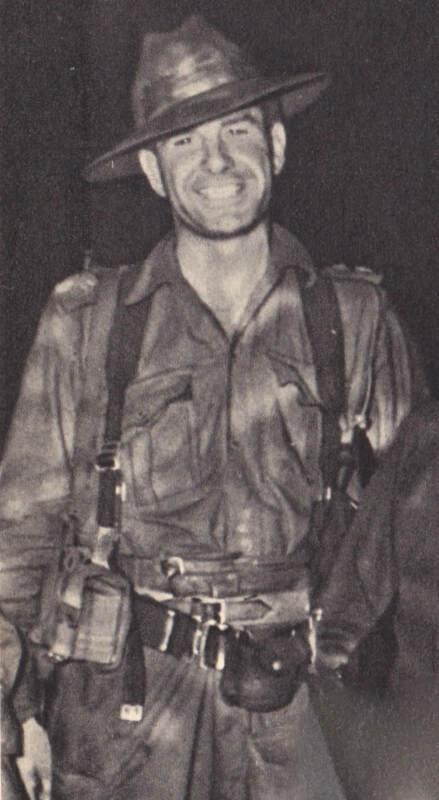 It is not known whether William was amongst this group of men, but we do know that he eventually volunteered to join the newly formed 15th (King's) Parachute Battalion in April 1945. 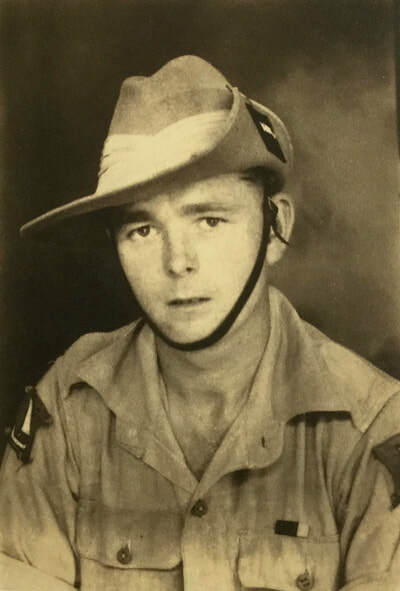 This unit was formed from a nucleus of volunteers from the 1st Battalion of the King's Regiment at Malthone, who had previously been involved with Special Forces and one or other of the Chindit operations. The battalion remained designated to the 77th Indian Brigade, but became part of the 44th Indian Airborne Division. Training commenced at Chaklala near Rawalpindi from March 1945, with officers and men from other units arriving to bring the new battalion up to full strength. Over the next few months all men received intensive parachute training before the battalion moved to Batrassi on the North West Frontier in May 1945. 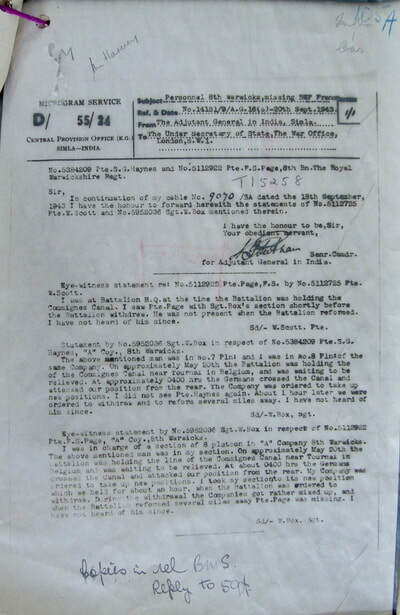 The battalion moved back to the hot and dusty conditions of Rawalpindi in July 1945, followed by a further move to Bilaspur, in central India, where they continued training for operations against the Japanese in other areas of the Far East and Malaya in particular. After the surprise dropping of the two Atom bombs in August 1945, all planned operations against the Japanese were suspended and 15th Parachute Battalion was eventually disbanded. 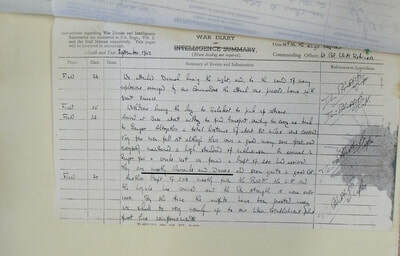 William Willetts had performed well in his new roll as a paratrooper and in November 1945, received a certificate of good conduct and character from the battalion's commanding officer, Lt-Colonel Peter G.F. Young. Not long after this time, the vast majority of the men from the King's Regiment were repatriated to the United Kingdom by troopship. Seen below is a gallery of images in relation to this short narrative, please click on any image to bring it forward on the page.